Stellar Four: Geek Girl Acceptance: The Evolution Will Be Televised. Geek Girl Acceptance: The Evolution Will Be Televised. Love Bites, a new NBC comedy, is probably one of the most boring episodes of television I have ever sat through, yet it's probably one of the most important 42 minutes of primetime TV for geek girls in recent history. Why? Because it was the very first time I can think of that a female science fiction geek has been portrayed as "normal." Instead of being an outcast or the quirky best friend, the geek girl heroine was socially adept and even attractive to "normal" guys. We're witnessing the evolution of the geek girl archetype on TV. Love Bites is a series of loosely related vignettes about love; a rip off of Love, Actually without the English people or the charm. The first mini story is about Cassie, a pretty grad student who meets a handsome man named Jordan at bar. The two hit it off and head back to her place. Though Jordan's friends debate whether or not it's a good idea that he date Cassie, there's no debate among the group that loving sci-fi is hot. Later on, both Cassie and Jordan confess to lying when they met (she's not a virgin, he's not a writer) but the two decide to give their burgeoning relationship a fresh start based on an allegory from Battlestar Gallactica. Don't let Jennifer Love Hewitt fool you. This is a different clip. An attractive, socially adept television couple just based the foundation of their relationship on a science fiction show? Why? The show clearly isn't aimed at geeks; this was no attempt at building geek cred with their audience. This wasn't a throw-away line. A significant portion of the plot is based on a mainstream-type guy attracted to a mainstream-type woman because she likes Battlestar Gallactica. We're witnessing the evolution of geek girl acceptance. Cedric Clark, in a 1969 article entitled Television and social controls: Some observation of the portrayal of ethnic minorities, postulated that there are four stages of media representation for minority groups. The first is "non-representation." As a minority, the role of the geek girl simply would not exist on TV. The second stage is ridicule. The stereotypical socially inept and often quirky woman that loves science, science fiction, fantasy or technology would serve as comic relief. Though it seems like that type of geek girl is not as popular in current television anymore, it still exists in one form or another. Look at nerdy, picked on Lisa Simpson in The Simpsons, awkward Betty Suarez in Ugly Betty, or brusk Amy Farrah Fowler in The Big Bang Theory. While all are portrayed as sympathetic characters at least some of the time, their roles are mainly to generate laughs at their outcast ways. The third stage is regulation; the minority group is represented in limited but socially acceptable roles like that of community protectors such as policemen or detectives. That type of geek girl now abounds on primetime TV. Brilliant goth scientist Abby Sciuto of NCIS always provides the necessary details to solve the crime. Quirky Penelope Garcia can hack into databases in a blink of an eye to assist the profilers on Criminal Minds. Whether she's geeking out on technology or magic, Willow Rosenberg was always there to assist the slayer on Buffy the Vampire Slayer. 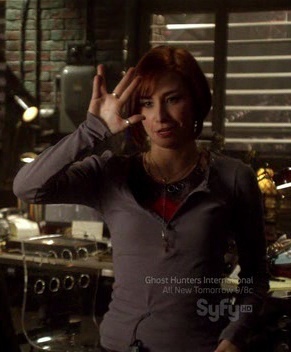 Claudia Donovan can jerry rig practically any artifact to help out at Warehouse 13. All have done much to expand the roles of geek girls on TV but all were portrayed in a limited capacity, the sidekick. The role of the geek girl has been transitioning to the fourth stage of respect over the past few years. Television audiences are beginning to see geek girls in starring roles, though the characters are still social misfits to one degree or another. Dr. Temperance "Bones" Brennan of Bones and Veronica Mars of Veronica Mars are great examples. Bones is a three dimensional character with flaws and positive aspects but is portrayed as having difficulty relating to the general public. Veronica is a fully realized character; smart, throws out geek reference like a champ and reads people like book. She's still, however, an outsider not accepted by her community. Love Bites' Cassie is solidly in the fourth stage of respect. She's portrayed as being socially adept and even sexually desirable while being a geek. A geek female character being presented in a positive light in everyday situations was a small step for situation comedies but a big step for geek girls everywhere. The only thing left for geek girl archetypes on television is to be portrayed in Clark's fourth stage on better quality shows. I love this analysis, very insightful! I don't think Amy Farrah Fowler's problem is her geekiness, though. She isn't even portrayed as someone who loves geek-stuff, is she? Just as a very, VERY analytical scientist who never stops analyzing. I'm so glad you liked it! It'll be nice to see geeky women portrayed as more than just a stereotype or the quirky best friend. As for Bialik's character, while I do conceed that she isn't geeky when it comes to science fiction or fantasy, she is at that level of intensity with regard to science. I'd argue that she personifies many of the stereotypical qualities associated with geekiness, most obviously being a social misfit. I actually like Big Bang Theory when I get the chance to watch it. It'd be nice if they had a range of characters though or focused more on Leslie Winkle.